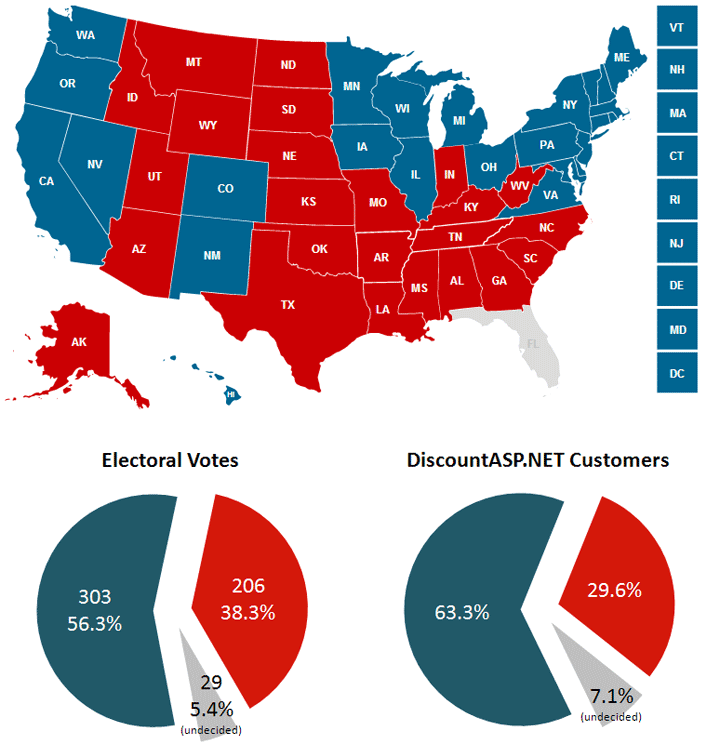 Four years ago we showed you a Presidential election map and a nifty pie chart demonstrating a pretty close correlation between the percentages of the electoral votes and our American customer distribution. Florida is still too close to call as they like to say, but even without it, you can see that our customer distribution continues to correlate pretty closely with the electoral vote distribution. We were six points away in 2008, and we’re about 8 points away this year. That could change depending on which way Florida flips. Compared to 2008, you can see that we have slightly more customers in “red” (electoral votes went to the Republican candidate) states than “blue” (electoral votes went to the Democratic candidate) states, and – wouldn’t you know it – there were more electoral votes from red states this year.